Language Magazine (LM): Why was BAC formed, and what sort of organizations are accredited? Paul Fear (PF): BAC was formed as a charity in 1984 by the British Council and UK Department of Education at a time when the British government, led by Margaret Thatcher, was withdrawing state involvement across a range of industries. 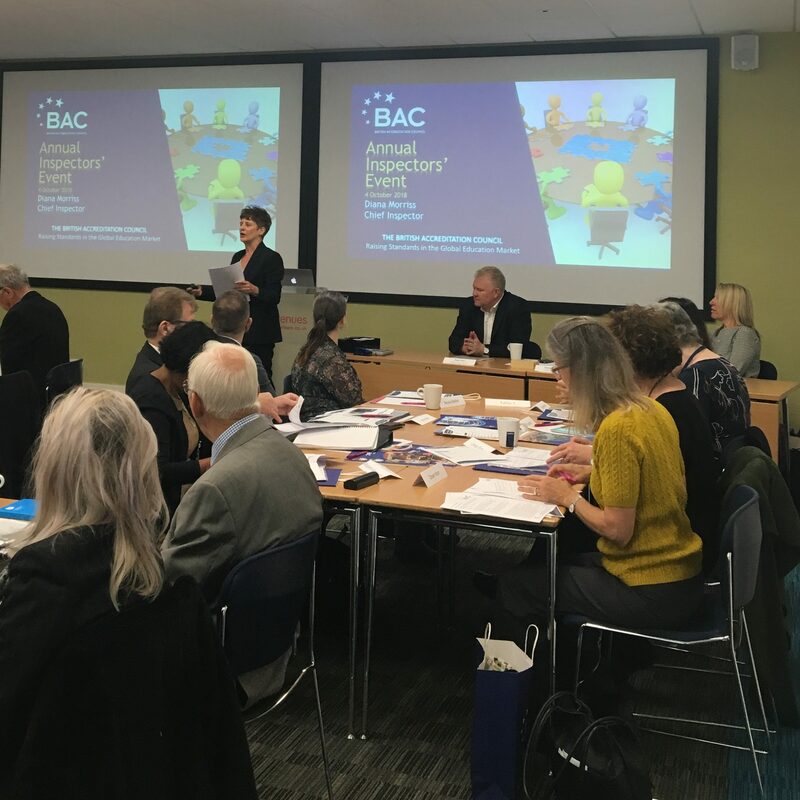 BAC’s original remit was to oversee independent further and higher education organizations in the UK with a view to encourage continuous improvement in standards in the sector and to provide transparency for students and other stakeholders. We did this for some time, but oversight of organizations which receive public funding has become the preserve of statutory bodies such as OFSTED (Office for Standards in Education, Children’s Services and Skills) and QAA (Quality Assurance Agency for Higher Education). Effectively, any organization that either receives public funding directly or takes students who receive public funding largely falls under the remit of these two organizations. As a result, BAC’s role has changed, although our focus on raising standards and providing transparency for all stakeholders not only continues but is now central to all of our work. We have a statutory function in the UK in that any institution we accredit in the UK can accept international students under the short-term study visa regime. This means that, in the UK, we accredit a diverse and eclectic mix of organizations. These range from an organization that offers an internationally highly regarded PhD program, some of the world’s leading deep-sea diving schools, high-end executive education, and music schools through to specialized summer schools. On top of this, we continue to accredit a number of private higher and further education organizations. This reflects the wonderful diversity and dynamism of the UK education and training sector, and we are very proud to be able to support their work. Internationally, we work with higher education organizations, private training providers, and now, with the launch of the International English Language Accreditation scheme, English language providers. We also work with NGOs and governments in developing quality-assurance capacity. By way of example, we have worked with the Higher Education Commission of Bahrain to develop an accreditation system for the kingdom’s higher education sector. LM: Why did you decide to move into the accreditation of English language providers? PF: We had been approached by organizations on a number of occasions asking for accreditation, so they could demonstrate to their students and other stakeholders that they offered high-quality provision. While we had been discussing the idea internally for some time, research showed us that the English language market contains some outstanding providers but there is almost no international mechanism to encourage the sharing of best practice, to recognize high-quality provision, or to provide transparency for stakeholders. This means centers of excellence struggle to differentiate themselves from other providers, to the detriment of all. As a result of the research, BAC took the decision to develop the International English Language Provider scheme with the view to providing a world-leading accreditation scheme which would recognize excellence in the sector, encourage the sharing of best practice, and provide transparency and confidence in accredited organizations. LM: Will schools in English-speaking countries and non-English-speaking countries be able to apply for accreditation on the same terms? PF: Absolutely! All organizations from any country are treated in exactly the same way for accreditation purposes. From September, though, we will be introducing differentiation pricing dependent on the income of the country. Although we are still working on the details, we are likely to use the International Monetary Fund’s (IMF) list of low-income, middle-income, and high-income countries to set fees. This will, we hope, allow organizations from all countries to be recognized for the quality of their provision. LM: How does BAC accreditation differ from British Council accreditation of schools in the UK? PF: I should point out here that the BAC scheme is not aimed at the UK but is designed for organizations outside of the UK. The BAC scheme is designed for an international audience, whereas the UK is a highly regulated environment with a number of statutory and regulatory bodies overseeing the way organizations operate. Ultimately, though, the key difference would, I suggest, be the attention BAC focuses, in addition to other areas, on the student experience, which includes the validity of the assessment process. We believe we have developed a world-leading quality-assurance framework for the international sector, incorporating best practice from across the education and training sector. LM: Is BAC accreditation a guarantee of quality? What are the key standards? PF: BAC accreditation means an organization has met BAC standards, and their report is published and is publicly available for anyone to read. It means that the organization is considered by us to be a trustworthy organization, and we list in our inspection reports areas for improvement. We work hard to ensure that organizations maintain and improve the quality of provision and have mechanisms to monitor provision. While we cannot guarantee that all provision will always be high quality—we would have to spend all our time at every school to do that—we can guarantee the organization has met our standards, has an effective quality-assurance mechanism in place to monitor quality within the accredited organization, and that if a problem should arise, BAC will always act to address quality-assurance issues. This area covers the ownership of the organization, management, the efficacy and effectiveness of administration, the assurance of adequate and properly qualified staff, the information provided to students, the mechanisms to ensure they are enrolled in appropriate courses, and the organization’s internal quality-assurance mechanism. This area assesses academic management, course content and delivery, learning resources, assessment and student feedback, and student support and advice. This area covers the pastoral support students receive and, if offered, accommodation and social activities. This area covers, as the name suggests, the quality of premises, classroom provision, etc. For those organizations offering distance learning, we have an additional set of standards covering ODBL. LM: Will BAC accreditation come with British Council endorsement, and is there a campaign to publicize BAC? PF: No, BAC accreditation is not endorsed by the British Council and we would not seek their endorsement. The British Council have a number of their own language centers, and any endorsement would be a clear conflict of interest. Secondly, we specifically set out to develop a world-leading quality-assurance scheme drawing on best practice from across the educational spectrum and drawing on BAC’s 34 years of experience. The British Council, I am sure, will be proud of the work conducted in their schools internationally, but BAC does not run schools. Our focus is ensuring that students and stakeholders have the best possible information about schools and so can make informed choices about where they study, as well as encouraging the sharing of best practice and raising standards. We are in the middle of a major publicity campaign since the launch of the scheme, which was held at the Houses of Parliament in the UK. This attracted significant press attention, and we are supporting this with a social media campaign. Other ongoing activities include sponsorship and attendance of conferences as well as our ongoing publicity and communication campaigns. We find the most effective publicity comes from BAC-accredited institutions and their students. We now accredit in more than 20 countries, and the BAC quality mark is rapidly becoming widely recognizable among students and other stakeholders, such as governments. LM: Will providers of online or hybrid English programs be eligible for accreditation? PF: Definitely, as mentioned above, we have specifically built in standards for online and distance learning. We are finding that ever-increasing numbers of institutions offer online learning alongside traditional teaching. This reflects the trend across all education and training providers, so we have taken the decision to build in standards for ODBL across all of our schemes. For more information on BAC, visit www.the-bac.org.